The Almond Blossom Festival or Fiesta del Almendro en Flor is celebrated every January in Tejeda, the highest town of Gran Canaria. The 3 days festival pays homage to the beauty of the most characteristic fruit that covers the peaks of this mountainous municipal. The three important festive days are always on the second weekend of the festival. Originally the Fiesta del Almendro en Flor was organised by the youngsters of the village, and the first event was in the year 1970. This group of young villagers decided to convert their love for this northern zone of Gran Canaria by having one day of activities as a tribute to its beauty. This celebration was created with the idea of maintaining culture and the municipals own traditions as well as the islands culture in general. The Fiesta del Almendro en Flor in Tejeda that was celebrated in the last week of January, is the most representative throughout the canarian culture. During the three days of celebration there are different representations of canarian folklore, traditional music, dancing, art, traditional sports, agricultural cattle fairs and demonstrations of rural activities that will keep all visitors entertained. Given the elevated costs of organising this kind of event in later years the ayuntamiento decided to take the cost on as their own. However the Ayuntamiento always receives help from the different neighbourhood associations who involve themselves in the preparation of each years event by providing a number of local typical products. All of these products are offered to the visitors to sample for the small price of only 1€, they includes frangollo which is a typical almond dessert, traditional stews and carnival tortillas and other local delicacies. The inhabitants of the village of Tejeda are absolute defenders of the typical canarian customs. Every year they give the silver almond award to a person, group or collective that have dedicated the previous year to conserving and upholding the canarian traditions. The trophies are real works of art, designed each year using an almond flower branch from the first branches and buds of the season. The program also includes special celebrations to involve the foreign visitors with the celebration of the TOURIST DAY. Tourists have the opportunity to see antique items that belong to the municipal, such as an old house, or an oil and vinegar shop. 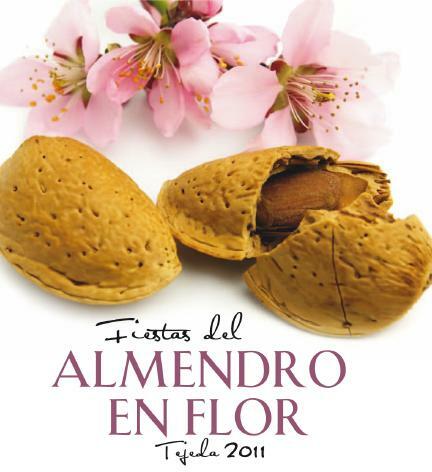 In 2014, with the 44th edition of the Almond Blossom Festival in Tejeda, the town finally achieved the title of ‘Fiesta de Interés Turístico de Canarias’, which is an award for a celebration with a tourist interest, and it has been included in the annual municipal festival advertisings. An award which is well deserved by the villagers of Tejeda, who for over four decades have managed to make all their visitors feel at home. Scroll down to see map, dates and other event information. Return to The R Guide Home to explore other topics of this wonderful island. Love to know your thoughts! Please leave us a comment below.